In year 9 I had an art assignment, which was to create a collage using different media and a lino print we created ourselves which had at least 3 colours in it onto a big piece of paper. I decided to make my lino print a turtle because I like turtles. 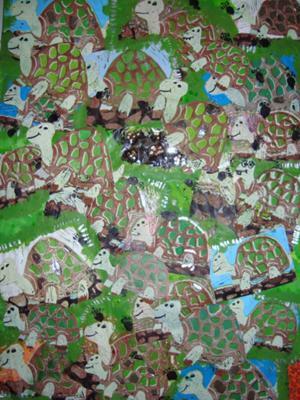 I chose to do the collage green because that is my favourite colour and it is a colour that usually represents turtles. I made a small turtle print and a large turtle print. I also made a turtle foot print. Thank you so much for sharing - you are our first teenage contributor. I love your turtles; they look as though they are on a march to somewhere important. Are they? It is so interesting to learn how you made the print/collage. I hoped that you will share more of your artwork. Your friends are welcome, too! I painted the background of the big piece of paper green then cut out the turtles from the paper I printed them on and glued them onto the big piece of paper. I then used the turtle footprint lino as a stamp and stamped it all over the paper so that it looked like a turtle had walked across the paper. I also drew little faces on each of the turtles. Next I used some silver paint to paint little lines around some of the turtles and to outline other turtles. I also used some silver thread and a needle to stitch the thread around other turtles as a border. And that is how I made my turtle collage. Click here to return to Teens' Art and Stories. I had an art assignment which was in the unit called 'The Shocking'. I chose to do my assignment on how brumbies are being culled. I find it shocking. I found six photos. 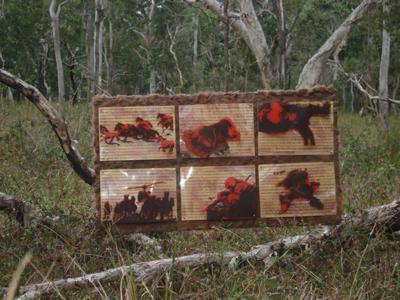 A man shooting a brumby, a helicopter rounding-up a mob of brumbies, a mob of brumbies running and two photos of a dead brumby. Well done Lucinda - keep posting your great artwork! You have a natural talent! Such a lot of work. Lucinda, what a lot of work that was but I really like your ideas and approach. Your picture looks good in the bush - where the brumbies roam. There is space for three more images on the webpage so I am wondering if you would be able to up-load some close-up photos of a couple of the sections as it is a bit hard to see details. Brumbies look so beautiful, wild and free, don't they, manes and tails flying as they thunder through the bush. I made each photo black and white and printed it at A4 size. I photocopied each black and white photo onto a OHT sheet, two copies of each image. I sticky-taped the pairs of photocopies together and then used a black permanent marker to go over every black mark on the photocopies. The photocopies were then transferred onto silk screens. I then got stencil paper for screen printing and traced an area around each shape of each image and then cut them out. I found words and articles about brumby culling from the internet, printed them then photocopied them onto six pieces of A4 OHT sheets. I got twelve pieces of clear acrylic perspex each A4 size and printed one of each of the silk screen images on each with brown paint. After the brown paint was dry I mounted the cut- outs onto a silkscreen and printed over the brown paint. On the other six pieces of perspex I silk-screen- printed gold paint. After the gold paint dried I spray painted the other side with copper paint. I then got a damp sponge and wiped away some of the gold paint on each background piece of perspex. After all that was done I drilled a hole in each corner of every piece of perspex. I pulled the backing off each of the foreground pieces of perspex and put a screw through each hole, the painted side facing backwards. I put three bolts on each screw then got a OHT sheet with a brumby culling article on it and drilled a hole in each corner, then put it on the screws behind the bolts that I had just put on. Next I put three more screws in each corner behind the OHT sheet then put the background perspex on, with the gold facing forward. I then put one bolt in each corner behind the background. After that I cut the extra bits of screw off then did the same with the rest of the perspex. 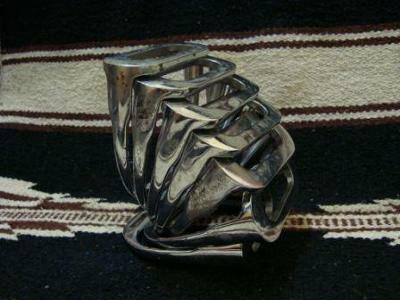 This is a collection of old stirrups that I collected and arranged for an art assignment. Thank you Ted and Nada. I really enjoyed making this art piece and I like how it turned out. It is amazing that you can take simple items and objects and turn them into beautiful artworks. So many simple items make such wondrous art objects. All one needs is imagination and the rest is history. Well done Lucinda! A Great photo and a really nice composition! I am proud of you! Lucinda, what a stunning sculpture you have created. Are the stirrups held together somehow? Their finish looks beautiful. How did you do that? It's interesting, isn't it, how the most common and ordinary objects can be made to look special. In Art at school we are doing a "Raw Umber" unit and were told to collect a range of old, found items. 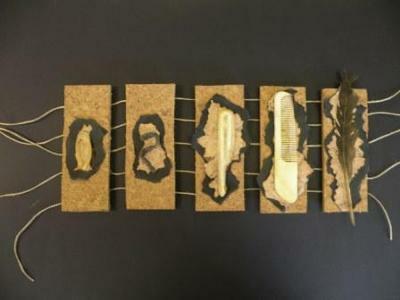 I found these old items and mounted them on crumpled paper and put shellac on them then put them on black, ripped paper. Then mounted them on cork board and put string between the boards. Ted, hit the title on the head. Lucinda: I think that TED has given the perfect name for your found items art. "IF THESE ITEMS COULD TALK"
And it is a conversation starter also. Whatcha say? Is that an appropriate name? Thank you Ted for the title suggestion. I really like it. I will change it to 'If These Items Could Talk' or maybe 'If Only They Could Talk'. That fella Ted E. Mueller is right on the mark with his comment. It is so appropriate I think the artist should use it. Right on Ted. Do you have some of your works to show too? If anyone has any good name ideas for this piece just let me know. Thanks. This would be a fitting title or a lead for conversation. Well done Lucinda. You presented your items very well. Keep going! Your work is inspiring. Maybe you could ask people to give your found objects collection a title? Did you enjoy making this? Lucinda, thank you very much for sharing your art work with us.